Introduction | "Mom, are you a chemist, too?" The chemistry activity called “Mother, are you a chemist, too?” for kindergarten kids is developed as one of the modules of a general science education project (Lángész) in 2011, targeting children from kindergarten to high-school. From 2013 the kindergarten chemistry educational program is extended to primary school pupils (1st and 2nd grade). Next to formal education institutes, the activities are running in community centres, science festivals and summer camps. The main goal of the activity is to familiarize children (age 4-8) with the basic chemical and physical phenomena using non-hazardous household materials. Activity, taking into account the specificity of the age group, using methods of informal education is developed. Literature and internet based examples of kindergarten and primary school chemistry education are collected to support the development of a new educational activity. Methodical background of chemistry activities (Steiner 1984; Steiner 1989; Heureka; Schenzer 2008; Barbosa et al. 2009) and one-day chemistry camps (Houck et al. 2014) is studied from different countries (Risch 2010). The idea of starting science education at the age of 4-5 years has a long history. Froebel’s kindergartens (Kahr 2004) reached millions of children with the basic crystallography in 1830s. The room of chemistry education in kindergarten is a contentious question among the scientific and educational communities (Bent 1985; Schliessmann 2008). Once we support the introduction of basic chemical reactions in kindergarten ages, the second question is, how to do this (Hubpages-1)? 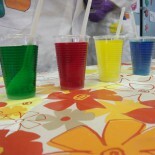 There are popular, colourful experiments (BrainPOP; MSN; Pennstate; ProTeacher; RSC; Seattlepi; Warwick; ZOOMsci) often applied by kindergarten teachers or at different science festivals for the youngest audience. Chapter books are a great way both to teach and reinforce understanding of concepts in science (Hubpages-2). In the era of computer based education materials and activities (Herga et al. 2014; ChemiCroc) live performed experiments (in front of the children) can be memorable experiences. Beside kindergarten activities our educational program is extended for primary schools, too. Chemistry component in the content of primary education is especially important for developing the competence of children’s knowledge (by solving different problems, analysing different materials, investigating natural surroundings, etc.) (Lamanauskas 2009). At primary school it is essential to work on children´s skills of observation and description, on pupils urge to ask questions, to formulate hypotheses, to discuss the experiments with classmates or to design experiences to get confirmation of the hypothesis (Ricco and Carnasciali). It is also of great importance to taking into account the potential health risks (IDAHO; USNLM) of the performed experiments.